My daughter, Chloe Pearl, loves when I bust out the blender to whip up a smoothie or smoothie bowl for her. We have an abundance of fruits and veggies over here right now and I am loving every minute of it. This morning we shared a delicious papaya smoothie. Papaya is a fruit that I do not normally have on hand so she was super duper excited when she saw me slicing the papaya and scooping out all of those seeds. We used half of a papaya, 1 whole banana, a handful of Simple Truth frozen mango, and a handful of Simple Truth pineapple. I used approximately 2/3 cup of Bolthouse Farms Plant Protein milk (unsweetened). We have been using that particular milk for a while now. Ibotta currently has a $2.50 cash-back offer on each bottle that you buy, and Kroger also had it on sale. So I consider that a win! My daughter really enjoyed her morning smoothie. I had a bit of it as well and I can certainly say that it was quite yummy. I am quite sure that tropical fruits rank pretty high as my favorite. A medium sized papaya comes in around 120 calories. Papayas can aid in digestion. Papayas have an enzyme in them that helps move things along, and they also have a high water and fiber content. There are two types of papayas: Hawaiian and Mexican. Hawaiian papayas are small (apx 1lb), while Mexican are large. The Mexican papaya can weight in as heavy as 10 pounds! 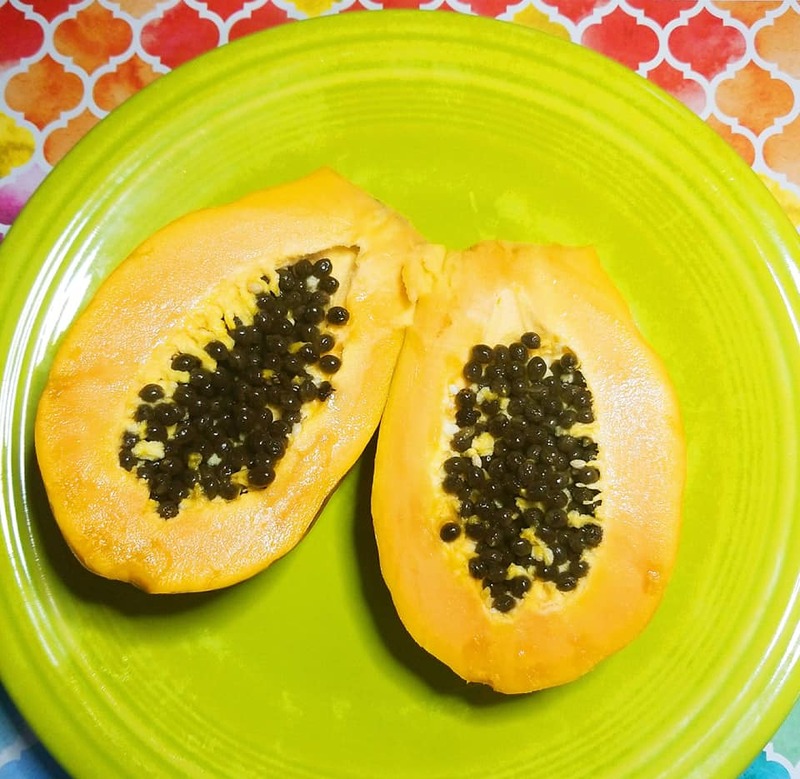 The seeds of a papaya are, in fact, edible. The seeds have a very strong mustard & peppercorn taste. You can add some honey to them to make them more palatable. Papaya is often consumed raw but it can be used in recipes to make a sweet sauce. Papayas haveÂ beta-carotene (an antioxidant) in them which can help prevent cancer. Papayas have a good amount of potassium and vitamins that can help prevent heart disease. I have been increasing my intake of fruits and veggies and trying to rid my diet of processed foods. There are so many health benefits in these foods it just makes sense to eat them. I have a big weakness for candy. If there is a bag of Sour Patch Kids in front of me I often lose my willpower and eat them. I feel guilty afterward even though I enjoyed them. My point is that it is just best to reach for fruits and veggies when a hunger pang hits. Instead of having a bowl of Fruit Loops for breakfast why not just make yourself a smoothie. They are both filling and nutritious. Your body will thank you for it! This entry was posted in My Cooking Journey and tagged banana, bolthouse farms, Chloe, dairy free, healthy breakfast, healthy food, mango, milk, papaya, pineapple, simple truth, smoothie, tropical fruit. Bookmark the permalink.